Simultaneous liver–kidney transplant (SLKT) has become a well-established therapeutic option for end-stage renal and liver disease. 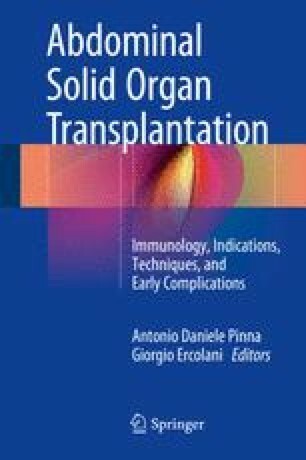 There is compelling evidence supporting the theory for an immunoprotective role assumed by the transplanted liver in preventing renal allograft rejection in SLKT from the same donor. Prioritization of liver transplant candidates with renal dysfunction by the MELD system has resulted in a substantial increase in the number of SLK transplants. The increasing prevalence of acute and chronic renal dysfunction among liver transplant candidates coupled with the burgeoning kidney transplant waitlist has motivated physicians to define and standardize selection criteria for SLKT. These include the definition and duration of acute kidney injuries (AKI), glomerular filtration rate (GFR) determination, and the duration of dialysis. The ideal cadaveric heart-beating donor for SLKT is aged < 60 years without history of kidney diseases, hypertension, and/or diabetes in stable pressure condition without or with mild dosage of vasopressor drugs. More often, cadaveric heart-beating donors are extended criteria donors (ECD), and liver biopsy is mandatory to assess the liver quality especially in the case of hepatitis B virus antibody core antigen positive, moderate or severe liver steatosis, and age > 60 years; in the latter case, a kidney biopsy is also mandatory to evaluate whether the kidneys are suitable for single kidney transplant or double kidney transplant or not suitable for transplant.